The NAHB International Builders Show 2017 was in Orlando at the Orange County Convention Center. Part of the IBS show is the annual NAHB Student Competition. Our Orlando video production company was hired to provide event videography of the student presentations competition. The competition gives students the opportunity to apply skills learned in the classroom to a real construction company by completing a management project/proposal. The proposals were submitted to a group of construction executives who act as judges. 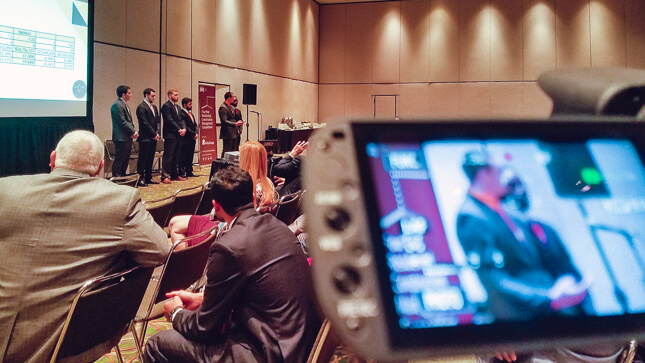 For three days during international builders show, the students defended their proposals in front of a panel of judges who are residential building industry professionals. Tom Hyde – Vice President, Miller and Smith, Inc.
60 teams competed in the 2017 NAHB Student Competition. The teams outstanding student presentations were given over three days in W224 C-D. The winners were announced at the 2017 International Builders’ Show NAHB Student Chapters Awards Ceremony. It was inspiring to watch the students present their proposals. You could tell that they all worked extremely hard. We do not know the students personally, but are extremely proud with what they were able to accomplish. Congratulations to the winners and all teams involved! Thank you to the National Association of Home Builders for hiring us to provide you with our event video production services for your annual NAHB Student Competition at the Orange County Convention Center.